Take a heavy bottom pan and put it on low heat. Add the flour and stir it well so that the butter and the flour is mixed well with each other. Now ensuring the heat is very low add about ¼ cup of milk and start stirring immediately. 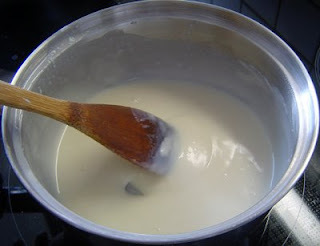 Stir continuously till you get to a very thick consistency and there are no lumps remaining. Now add another ¼ cup of milk and repeat the process, but this time the sauce would be a lightly lighter in consistency than before. 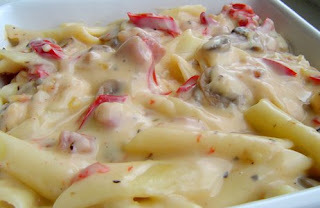 Once again add the remaining milk and keep stirring constantly till you get a smooth white sauce without any lumps in it. If required you may take the pan away from the heat while stirring from time to time. In case the heat is too much the lumps will tend to form more easily. Keep the heat very low and continue to stir occasionally. Add about ½ tsp of salt. Grate the cheese and add it to the sauce. Let the cheese melt, remove from heat and leave it aside. Cook the macaroni in a pan full of boiling water. Make sure that you let the water come to a boil before adding the macaroni and also add about 2 tsp of salt. Cook on medium heat till just done. Drain the water, wash the macaroni with cold water. Mix 1 tsp of oil and leave it aside. Cut the garlic into juliennes, chop the chilli, with the ends cut diagonally. Wash the mushrooms well and slice them. Chop the bacons into small square pieces. Heat a pan and melt the butter first. Now add the mushrooms and garlics. Stir fry till the mushrooms are soft and lighly brown at the edges. Add the bacon till the bacon is also fried a little. 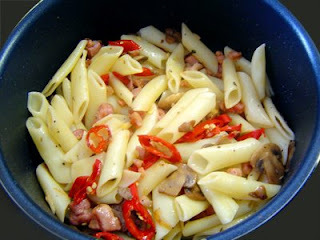 Now add the macaroni and the red chillies. Also add the pepper powder and oregano and about ½ tsp salt. Saute’ the macaroni with the other ingredients for about a minute. Add the cheese sauce and the milk. Stir for a minute, check seasoning and remove from heat.